Rich Hill will not be there for the playoffs. Neither will Mickey Jannis. All have brought bonus attention to the Atlantic League this season. But one of the special aspects of this star-studded circuit finishing up its 18th season is the depth of personalities. One hundred other Atlantic League players will be battling with all of the energy they can muster to have champagne poured over them and to hoist the championship trophy in the early days of October. Here are a few snapshots. Long Island, the wild card entry among the four contenders, has its leader back. Former major league outfielder Lew Ford, the league's MVP last season, spent much of July, all of August and the early days of this month playing in the Mexican League, but he was keeping up with the Ducks. "I was checking on them every day and kept in contact with GM Mike Pfaff to see how everything was going," Ford, 39, told Newsday. "I was hoping we'd have a chance to make the playoffs. We've done it before. We have guys on this team that have won before. I have a lot of confidence." Regular season powerhouse Somerset, the only team to win its division in both the halves of the split season, has among its talented cast infielder Matt Fields. After being released by Arizona in July, he needed to find his passion for the game again in order to contribute. “It was a battle with myself,” he told MyCentralJersey.com. “I talked to my family, my wife and people that are truly important and special to me, and they were just like, ‘Hey, you’re 30 years old, so you’re still young. You’re talented, you’ve still got what it takes, so don’t give up on your dreams.’"
Brian Burres, whose first major league victory came at fabled Fenway Park for Baltimore eight years ago, is part of the hopeful scene at Southern Maryland. “The level of play is high (in the league),” Burres told The Portland Tribune in his home state Oregon. His goal: “Honestly, it is to win. I think everyone on the team has the same goal." Lancaster bounced back from an unexpectedly slow first half to dominate the Freedom Division for the last 70 games with the likes of veteran Scott Patterson lending a hand. The first Barnstormer to reach the major leagues (New York Yankees, 2008) did not walk a single batter from July 18 until the next-to-last day of the regular season. Will it be one of these players or someone else out of the other 96 who cements the title? Stay tuned. Rich Hill was lavished with praise and even got himself into the Boston Red Sox record book in his second major league start following his meteoric rise through Long Island and Triple-A Pawtucket. He became the first Red Sox hurler to strike out 10 in each of his first two starts with the club and one of four this decade (Pedro Martinez, Jon Lester, Felix Doubront) to reach double digits in back-to-back games. Hill won his first major league game as a starter since '09 when he limited hard-hitting Toronto to three runs (seven hits) in seven innings. Boston won, 4-3. "I guess my expectations were just based on what people were telling me--that he was throwing better than anyone at Triple-A in our rotation," president of baseball operations Dave Dombrowski told MLB.com. "We needed someone to go out there that could keep us in the game and give us a chance to win. That's what the expectations were and of course he's far exceeded that the couple of times he's gone out there. It's tremendous." Interim manager Torey Lovullo added: "It's been a tremendous lift. And exactly what we needed." 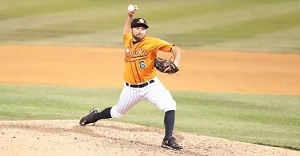 Knuckleball-throwing Mickey Jannis started the season by posting a 6-2 record with a 1.18 earned run average and allowing only 53 hits in 83.2 innings for Long Island and finished in the New York Mets farm system. Now he has been invited to hurl in the Arizona Fall League, which is generally only limited to players considered to have decent major league potential.